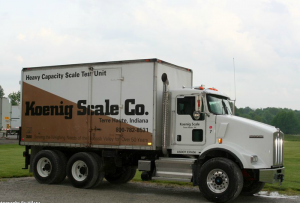 Koenig Scale is a service-oriented, service-focused business. We have 5 full-time service technicians (of which 2 technicians are certified by Mettler Toledo as “Master Technicians”) to serve not only your calibration needs but also any emergency repair requirements. We understand that broken equipment with the associated downtime is expensive. We offer 24 hour service and strive for a response time of fewer than 4 hours (technician within your facility within 4 hours), in addition, we stock a large inventory of spare parts and replacement equipment to ensure we “fix it the first time”. In addition to the Mettler Toledo certifications, we have five licensed & registered servicemen with the State of Illinois Department of Agriculture. As an authorized Premier Mettler Toledo Distributor, we use Authentic Mettler Toledo Parts. Our Team is able to work on any brand of scale equipment. Our Technical Support Group is available for both application assistance and service guidance. If you prefer to call us for technical support (1-812-877-6121), we are ready to assist you. In the event of a down condition request, we will provide technical support and guide you as we resolve the issue. If we are successful, a modest technical support fee will be invoiced. In the event, we cannot resolve the issue together and a field service dispatch is required, there will be no charge for the technical phone support. The above pictures feature our fleet of trucks. The gold truck to the right is used primarily for the testing of vehicle scales and has over 21,000 pounds of certified test weights. All of our test weights are NIST traceable and are re-certified annually.